I would like to share with our friends a Lenten reflection based on the very important Gospel we heard a few weeks ago, on the 1st Sunday of Lent (I know that was a while back, and I beg your pardon, I am a slow thinker!). If you recall it was the Temptation of Jesus in the Desert (Matt. 4:1-4). I feel that we can learn a lot from the conversation between Jesus and the devil, as it reveals two completely opposite mindsets. Let me explain. 1st Temptation: In the first temptation, Jesus has been fasting for 40 days and is hungry. The tempter approaches and says to Him, “If you are the Son of God, tell these stones to become bread.” If you are the Son of God…We see from this that for the devil, what being the Son of God is about is: Power. “You have the Power, so use it! Take what you want!” How does Jesus respond? “It is written: ‘Man does not live on bread alone, but on every word that comes forth from the mouth of God.’” For Jesus, being the Son of God is all about Obedience, being in loving Union with the Father. 2nd Temptation: The next temptation continues to teach us. “Then the devil took him to the holy city and had him stand on the parapet of the temple, and said to him “If you are the Son of God, throw yourself down. For it is written: “‘He will give his angels command concerning you, and they will lift you up upon their hands, lest you dash your foot against a stone.” From this we see that for the devil being the Son of God is about Taking Control, making things happen. How does Jesus respond? “Jesus answered him, “It is also written: ‘You shall not put the Lord your God to the test.’” For Jesus, being Son of God is about Trust in God and His Way of bringing things about, even if they be simple and hidden. 3rd Temptation: The final temptation is also instructive. “Then the devil took him up to a very high mountain and showed him all the kingdoms of the world and their splendor. And he said to Him “All this I will give you, if you will bow down and worship me.” From this we see that for the devil, being the Son of God is about being Important, the Center of All. How does Jesus respond? 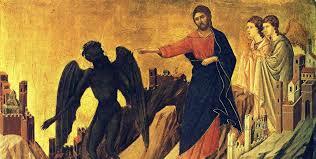 “Jesus said to him, “Away from me, Satan! For it is written: ‘The Lord, your God, shall you Worship, and Him alone shall you serve.’” For Jesus, being the Son of God is about The Other being the Center. Conclusion: This conversation between Jesus and the devil instructs and challenges us, to examine our own ideas about what it is to be the Son of God, to be sons and daughters of God as we are all called to be, to examine our ideas about Who God Is. You know, there is a temptation for all of us to hear about the Son of God as the Suffering Servant, as the Crucified One, and, perhaps subconsciously, to put all of that to the side, to the periphery of Who God is, and to think that, when the masks are removed and the veils are peeled away, that at the Center of the Universe, yes, we would find what we always expected to find: Cold, self-sufficient Power. But, that is not the God Jesus reveals, the Trinitarian God. At the Center of the Universe we find instead: powerlessness, vulnerability, completely self-emptying Love. It is a great challenge not to have the devil’s view of God: That God is Power, Control, the Center of All… and to put on instead Jesus’ view of God: completely self-effacing Self- Gift, self-surrendering love. This may be something useful for us to meditate and reflect on as we continue our journey through Lent.